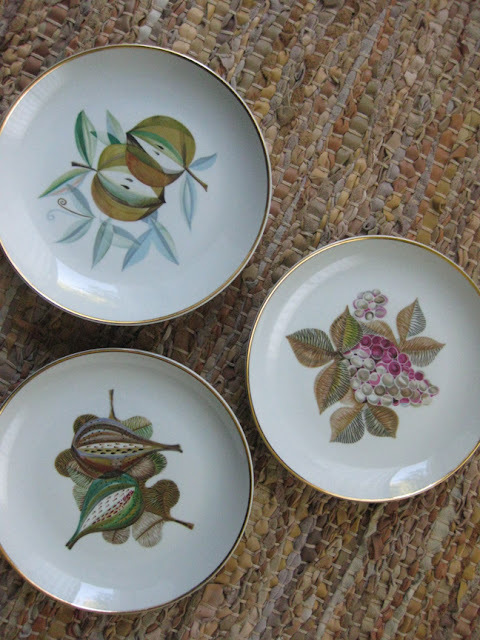 Bought these lovely small plates yesterday during a day of otherwise unproductive thrifting in the rain. My only hesitation before buying them? 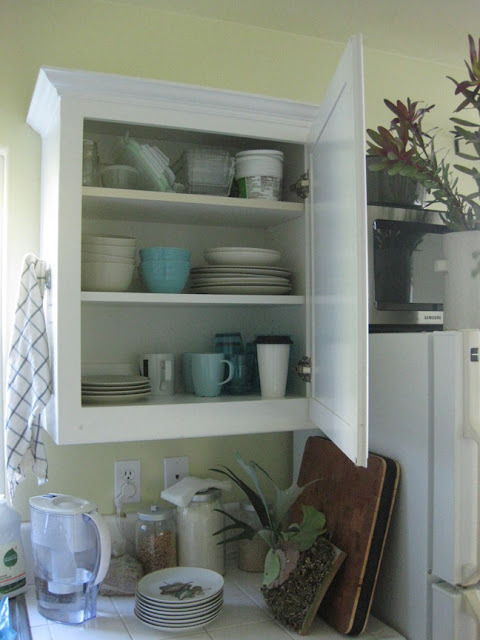 Where will they fit in my tiny, cupboard challenged kitchen. (Oh, that's my new staghorn fern! So pretty). My new fern is leaning on the counter because he needs to be dampened quite frequently, and I haven't figured out where I can hang him and easily be able to bring him down to the sink for little showers. Also, what can I back him with that will protect the wall from moisture and still look good. I'm thinking some kind of small round mirror? 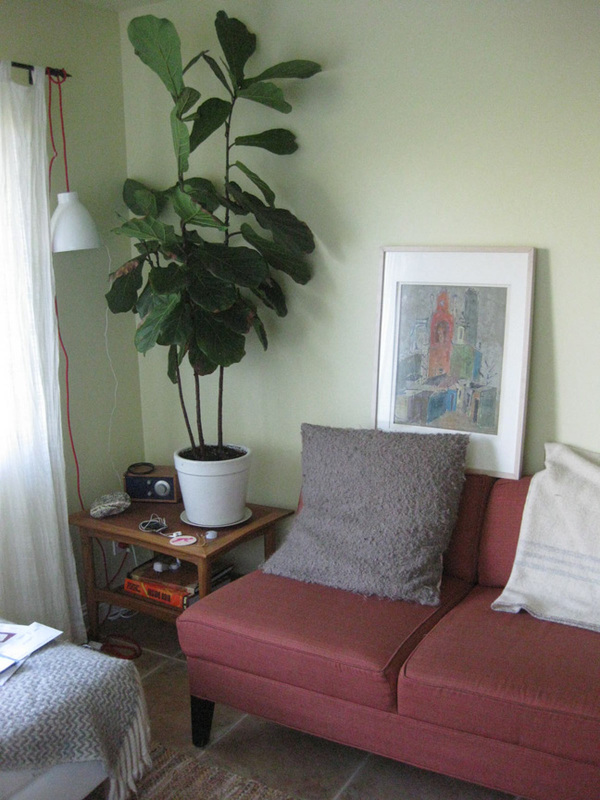 Meanwhile, I've made a little more progress on pulling the apartment together by re-potting the fig and framing the Mexican painting. Need to decide how I'm going to hang things without making a mess of the plaster. I think I'll wait for the next rainy day for that. Today is sunny, and I want to enjoy it outside. Nice to see your fiddlehead fern. The one in my living room is getting so big I don't know what to do with it. I "pruned" (probably incorrectly) a few leaves off of the end of each branch in September but they have already grown back! I have another one in our kitchen that is very similar to yours above and is threatening to take over. I need a bigger house. Are staghorn ferns hard to take car of? Finicky in cold weather? I love the way they look. @Emma-- This is the first staghorn fern I've had, so I'm not sure how finicky it will be. It's an understory plant and definitely tropical, so it likes filtered light and moderate temperatures-- no direct sunlight. The nursery told me that it likes it's base damp and can be misted, but that most people kill the by over-watering. And also that you can feed it by stuffing a banana peel under it's basal leaves because it likes the potassium. Seems like something you could only do when it's an outdoor plant, or it might stink to high heaven! Probably won't try that until next summer.